The Pinnacle Porter Cable 7424XP Show Car Kit delivers show-car quality results! Kit includes Pinnacle swirl removers plus Liquid Souveran Wax and Crystal Mist. The Porter Cable 7424XP enhances the performance of Pinnacle swirl removers. 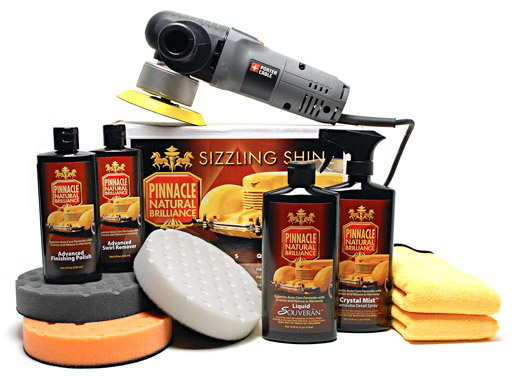 The Pinnacle Porter Cable 7424XP Show Car Kit combines quality products with the ease and performance of the Porter Cable 7424XP Dual Action Polisher. 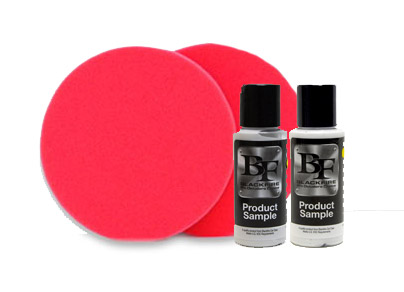 With this kit, you can transform your vehicle into a show car! Remove imperfections, protect the paint under a glossy coating, and maintain the glow day after day - all with the Pinnacle Porter Cable 7424XP Show Car Kit. Porter Cable 7424XP Dual Action Polisher has all the user-friendly features of the original Porter Cable 7424, but a 4.5 amp motor enables enhanced performance and durability. The Porter Cable 7424XP Dual Action Polisher operates from 2,500 OPM to 6,800 OPM to provide a faster defect removal rate. The 7424XP features all ball and roller bearing construction with spiral/bevel gears and an improved switch design. The buffer accepts a 5/16-24 spindle thread. The pad diameter is 6 inches. The polisher includes a wrench, side handle, polishing pad, and a operating manual. Crystal Mist Carnauba Detail Spray has a distinctive, wet-looking shine. Carnauba, combined with crystalline polymers, creates sharp reflections and silky paint. This state-of-the-art carnauba-polymer matrix also enables Crystal Mist to bond to the existing wax for an instant but long-lasting gloss. On top of Liquid Souveran� Wax, Crystal Mist reactivates the existing wax so you�re not just seeing a surface gloss � you�re seeing the depth and dimension of multiple layers of carnauba. Two 16 x 16 inch Gold 75/25 Microfiber Towels are made of a heavy 360 gram blend of polyester and polyamide with a dark blue border. These towels are plush enough for buffing and quick detailing, yet absorbent enough for drying. Their generous size will help you complete detailing jobs quickly.